Learn material straight out of my professional repertoire! 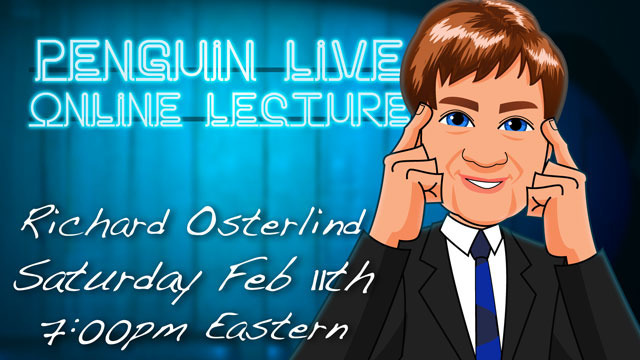 Today, when you order "Richard Osterlind LIVE", you'll instantly be emailed a Penguin Magic gift certificate. You can spend it on anything you like at Penguin, just like cash. Just complete your order as normal, and within seconds you'll get an email with your gift certificate. 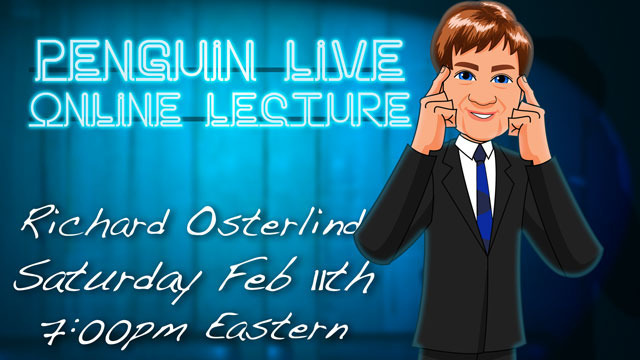 Richard Osterlind LIVE (Penguin LIVE) One of the legends of mentalism joins us to share 3.5 HOURS of wisdom and a strong collection of HEAVY DUTY mentalism. SUPPORT LIVE MAGIC. DOWNLOAD THE FULL LECTURE TODAY. Richard Osterlind has been a top corporate performer for over 40 years. He has traveled around the world entertaining presidents, heads of state, foreign dignitaries, CEO executives, sports figures, newscasters and audiences from every walk of life. He has become a legend in the corporate world. If you could ask ONE question to one of the world's best mentalists, what would it be? If you’ve never been to a magic lecture, there’s never been a better time. Saturday Feb 11th at 7:00pm, we’re live-streaming Richard Osterlind in a spectacular 2-hour interactive online lecture. Purchase the Richard Osterlind LIVE “product”. This is your ticket. On Saturday,Feb 11th, anytime before 7:00pm Eastern, click the “MyPenguinMagic” area at the top of the Penguin site. You’ll see the livestream appear 1 hour before showtime. At 7pm sharp, Richard will hit the stage and begin his JAM-PACKED professional lecture. Reserve your seat anyway. Within hours of ending, you’ll be able to download and/or watch the full lecture on-demand, and go over all the great routines and subtleties as many times as you want. It’ll be waiting for you in your “MyPenguinMagic” area. Magicians flock to see “workers” give talks. Why? Because these guys see and learn things that you won’t find in any book or DVD. Yes, Richard will be teaching some incredibly powerful A-material, but the INVALUABLE stuff will be the insight he shares along the way. 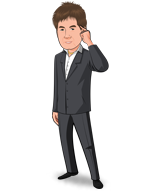 Richard has also become known as one of the leading teachers of Magic and Mentalism. With 26 videos and over 20 books to his credit, there is hardly a performer who has not been influenced by his work. His down-to-earth manner of performing, coupled with his original, audience-tested methods, has made him a favorite in the eyes of his peers. He has constantly shown his ability to take time-honored secrets and update them for the modern world and his instructional materials have probably made more money for mystery performers than any other living instructor. This online lecture will feature Richard demonstrating some of his classic routines with incredible insights into the reasoning behind the success of his award-winning material. You will not only learn how to effectively perform these effects, but also how to create your own, original Magic and Mentalism. Featuring a special Q&A section after the lecture where you can ask your mentalism questions to the master. I have always found mentalism to be boring, but I had heard such amazing stuff about Osterlind and I wanted to find a few powerful mentalism effects to do. Saw this video got great rating, I guess I just don't get mentalism. After watching him, I continue to be turned off by mentalism. Was hoping this "master" would have blown me away with material and performance. It was typical stuff,nothing mind-shattering. his material: classic mentalism effects, nothing that made me fall out of my chair. Although his opening effect was great and I will use it. For that effect alone, it was worth the money but this 3hr 15min video could have easily been cut down significantly. He spent about 30minute alone on the performance and explanation of the first effect, way too long. 18 of 29 magicians found this helpful. I've already have seen some videos of Mr. Osterlind so I decided to buy this lecture. Amazing. Now I wish to buy the other videos of him (that I still don't have). About 3:15h of video. SO MUCH (AND GREAT) MATERIAL ! Penguin, i would like to share a tip with you. After you have an great magician doing the lecture, have an promotion of him material. For example, even if you don't give an discount, create an Feature Pros with the guy material to sell (all Osterlind Mind Misteries for example together in one place) ;-) ! Thank you Mr. Osterlind for this lecture ! P.S. : The unique con is that until the middle of the video, some guys asked him without a microphone. About half the video, I think someone in Penguin remember to have an microphone to the people asking. BUT EVEN WITH THIS (only 2 questions), THE VIDEO IS A MUST ! After receiving training from Richard in a similar setting years ago, I was - while still at the seminar - booked for a $1200 show...and was kept busy for months afterwards. Richard offers something very rarely seen: true magic and mentalism which can be provided completely surrounded, with people looking over your shoulder - and the same effects can still play BIG onstage. I've seen and performed both now - and have seen Richard drive hotel staff members completely wild close-up. Angel's and Blaine's filmed reactions were NEVER as huge as I saw from those who came in to see Richard plucking thoughts from the air. "He KNOWS things!" screamed one young woman as she ran from the cafe! This lecture has ALL these ingredients - nothing held back! When I tell you that studying this lecture can make you much more amazing than anything you've seen on TV, I'm not exaggerating in the least. 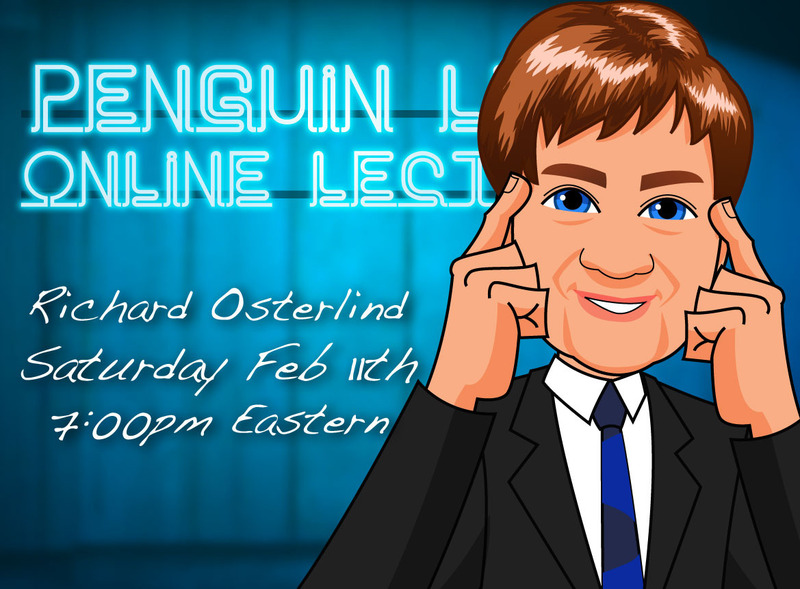 This is a recording of a live lecture Richard Osterlind did on Penguin Magic. As lecture is is not fully scripted and edited performance, still I give it the highest rating. It is not really just a performance of effects followed by explanations, though both of those occur. In fact, one effect Richard would not explain...and I do not blame him. He also makes a mistake with the first effect in the set up and later explains what he did wrong admitting his error and giving advice later on what can be done when something goes wrong. The lecture is valuable more for its advice on performance, handling of volunteers and general ways of being a magician or mentalist and how a performer should be giving something to his audience...and I do not mean props...but experiences the audience can take with them for the rest of their lives. This lecture has great general advice that would apply to any kind of magic from close-up to stage illusions and several tricks you can learn to do easily. As a recorded event from a live Internet lecture, it lacks in production values, but that is simply not important. It is a little dark, but I guess Penguin will correct that in the next video download of Richard's next Internet lecture. Thank you Richard for this and I will download your next lecture. I had the opportunity to attend this lecture and it was AMAZING! Richard is the best out there. I learned so much that you cannot learn from a dvd or book, and I have many of his. This is a must see! Thank you Richard and Penguin for giving us an intimate look at the best in the business. I would like to share my impression of the video with you. The presentation was structured, solid and well-prepared. It was fun to listen to stories from Richard Osterlind's life. A lot of nuances in mentalism effects have been revealed in a good and comprehensible way. You can watch this amazing video for over 3 hours! Thanks Richard Osterlind and Penguin group. He is one of the all time greats. This lecture is classic Osterlind. I love Richard Osterlind's material. He's always able to take classics and turn them into real gems. Although I knew a few of the effects presented in the lecture (because I've got quite a few of his DVD's), I learned quite a lot from it. Not only incredible effects that will definitely go into my repertoire, but also some very insightful advice on performance, which is absolutely essential in mentalism. Whether you are new in this field or an experienced performer, I'm sure you will find some very good stuff in here. Richard is not only a marvelous person he is a consummate professional always striving to make what he does better, something he has been doing for years. We have the great fortune for a small fee to sample his vast repertoire and learn tried and tested material. This is still my favourite lecture, I hope he does another. I loved the variety of material covered, the way it was presented....everything. Kudos to Penguin for putting him on.